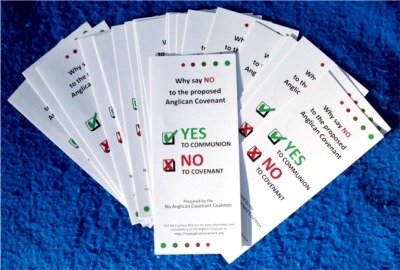 The No Anglican Covenant Coalition distributed both buttons and brochures at the recent General Convention. For the benefit of those who did not attend, you can see one of our buttons in a previous post. Click here to see the content of the brochure, which was designed specifically for distribution at the 2012 General Convention. You can find pictures of Malcolm French and me at our General Convention display on my own blog.